Richard and Liz welcome you to Harbour Guest House, Tobermory. Harbour Guest House offers bed and breakfast accommodation in one of the most stunning locations in Scotland - Tobermory, on the Hebridean Island of Mull. Tobermory, the largest settlement on the Isle of Mull, developed as a fishing port in the 1780s and is famous for its brightly painted buildings around the picturesque harbour setting. Originally a fisherman's cottage, Harbour Guest House is one of the colourful buildings situated on the water front of the harbour. Looking out over Tobermory Bay to Calve Island, the Sound of Mull and the Morvern Hills beyond, it is in a perfect location for your stay. Step out of the front door and stroll along Main Street to visit Tobermory's restaurants, cafes, shops and galleries, take a boat trip from the pier, perhaps visit the Aquarium or the Distillery. See our Location page for a useful map and directions. 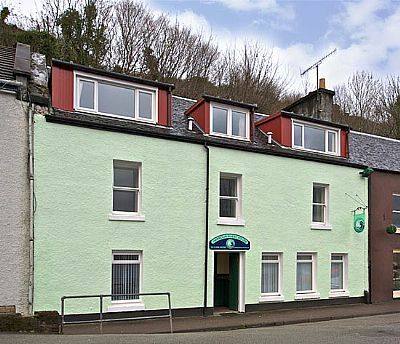 We offer a very warm welcome, comfortable accommodation and a hearty Scottish Breakfast. Our rooms are located over 3 floors, many with stunning views over the harbour, all en-suite apart from one with private bathroom. We have a relaxing lounge area overlooking the rockery garden and bird feeders, free wi-fi throughout, free parking outside the Guest House or in the nearby car park, secure indoor cycle storage and a bus stop within 100 metres. Whether walking, touring, wildlife watching, photographing the amazing landscape, visiting castles, listening to live music or theatre or simply relaxing, Harbour Guest House in Tobermory is the ideal base for your holiday.